At the finish of his swing, 2011 U.S. Open champion Rory McIlroy has pivoted completely. It's amazing how much weekend players struggle to make the pivot turns in their golf swings. Give them a plastic flying disk, a baseball bat, or even an ax and they will probably make the proper move naturally. Use a few simple checks during your swing to be sure you're pivoting properly as you turn back and through. Both of McIlroy's elbows are still straight because he has turned his shoulders early. If you want to make a good pivot, you need to start turning early. Too many players begin their backswings by lifting their hands and bending their right elbows. A good backswing begins with the shoulders turning in a one-piece takeaway. Many players think this means they should lock their elbows and make a stiff turn away from the ball, but that is wrong. Your arms can remain both relaxed and straight if you turn your shoulders to start your swing. Here's your first checkpoint: If both elbows are still straight and relaxed when your hands reach waist high on your backswing, you've started your pivot turn correctly. At the top of his backswing, McIlroy's back faces his target. Your second checkpoint comes at the top of your backswing. After making a good turn to start your backswing, finish this turn. Your back should face the target, which means you completed a 90-degree shoulder turn. This is sometimes called a "shoulder coil." Pros often turn as many as 110 degrees at the top, but a 90-degree turn is a good, full turn for a weekend player. 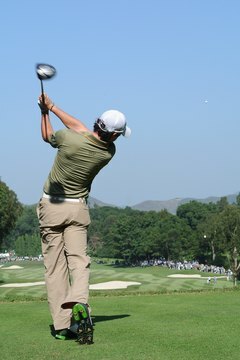 Both of McIlroy's knees are flexed and parallel to his target line as he comes down to hit the ball. Many players struggle to get their downswing turn going. They've heard that their hips should lead the swing. They've been told to shift their weight to their left side. Some teachers stress a hip turn, others a hip slide. Here's a simpler third checkpoint that will guarantee you start your turn back to the ball properly: Just squat a little. Try to flex both knees the same amount and realign them parallel to your target line. It will feel as if your lower body returns to its setup position. You will be in this position only for an instant, but you will be able to feel it. Once you do, you'll know your lower body started turning properly. 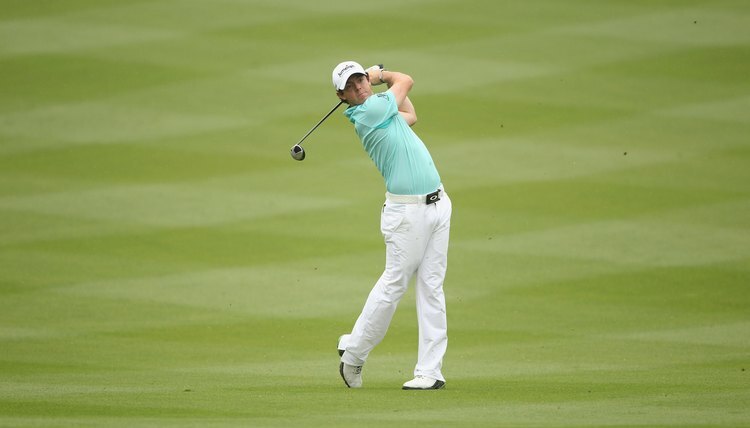 McIlroy's hips have turned completely and his weight is on his left side. Your final checkpoint is your finish position: You should be standing with most of your weight on your left leg and your belly button pointed to your target. 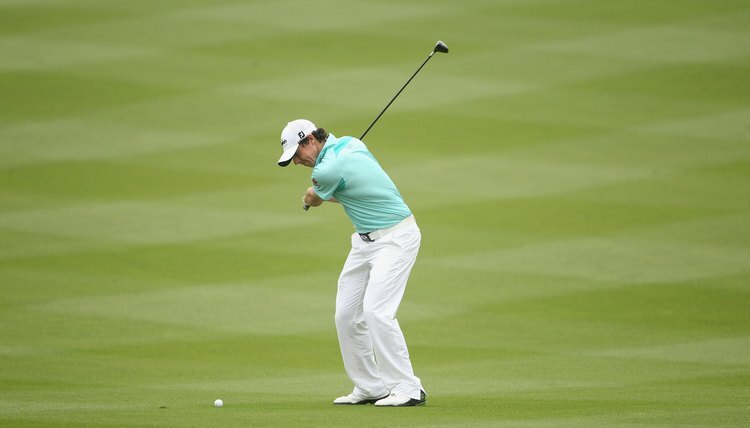 To reach this position, your hips will have to turn completely through the shot. Your upper body will be pulled through to the finish as well. At the top of your backswing, your chest is pointed to your right; at the finish of your swing, your chest points to your left. Best of all, you can practice this entire sequence of moves without ever holding a club. Just take your setup position, cross your arms across your chest and practice "swinging" from your setup to the top of your backswing, and then through to your finish. If you can do that properly, your pivot turn is in good shape.